Now that Mera has become Queen of a raised Atlantis, Aquaman is trying to protect his queen and love from an attack by the Suicide Squad who is trying to detonate a nuclear bomb to destroy the underwater kingdom. Urcell, Rath’s former ally has allowed the Suicide Squad in Atlantis but is having doubts about the destruction of her home. Can Aquaman save the day? I like the conversation with Mera and Aquaman about trust and responsibility. Aquaman’s motives were fine but Mera, as she has done many times in the Dan Abnett run has become the voice of reason that puts some sense in the hero. 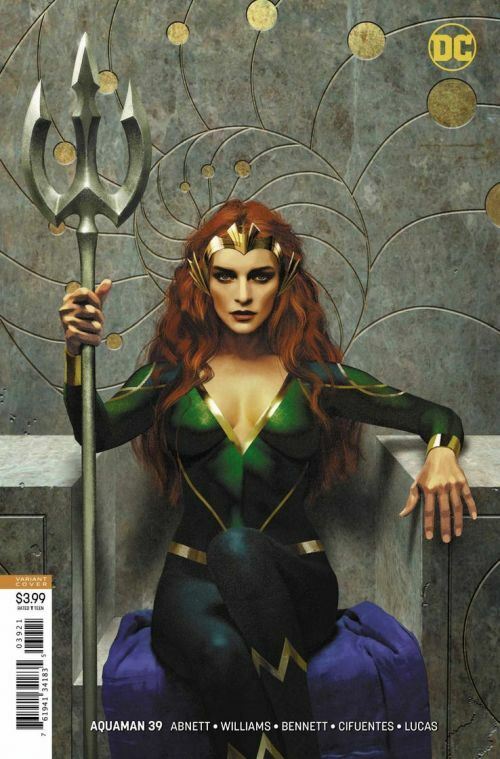 Mera appears regal and well-suited for ruling Atlantis. The Suicide Squad, especially the new members are quite funny this issue. Not much really happens this issue but it reads well as part of the crossover with the Suicide Squad. Joe Bennett has been working at DC Comics for years and has filled many gaps. This is not a good thing. I feel like his talent is used to fix problematic series because he can deliver on time and work on any kind of series. Here, there is an attempt to reconstruct the loose illustrative style used recently in Aquaman and it does not work. Bennett needs a strong inker, not soft shades. The comic looks odd and does not play to Bennett’s strengths even though he is usually a serviceable and solid illustrator.